Questions from three U.S. senators to a nominee to a federal appeals court are raising the eyebrows of some Catholics who see in them a lingering bias against Catholics serving in public life. During a confirmation hearing on Wednesday for Amy Coney Barrett, a law professor at the University of Notre Dame who has been nominated to serve on the 7th Circuit Court of Appeals, Senator Dianne Feinstein, a Democrat from California, grilled the nominee about her views on Roe v. Wade and whether her religious views would hurt her ability to be impartial on the bench. The senator referenced speeches given by Ms. Barrett, who is Catholic, to conservative legal groups and a 1998 article she co-authored about the obligations of Catholic judges in cases involving the death penalty. Ms. Barrett and John Garvey, her law professor at the time and now the president of the Catholic University of America, argued in the 1998 article that Catholic judges who share the church’s view on the death penalty should consider recusing themselves from cases in which they feel they cannot rule impartially because of their faith. “I suspect what really troubled them was that, as a Catholic, her pro-life views might extend beyond criminal defendants to the unborn." Mr. Garvey rejected that interpretation. “Barrett [and I] said no such thing. We said precisely the opposite,” he wrote in an op-ed published Thursday in the Washington Examiner. He went on to write that he sees anti-Catholicism lurking behind the questions from Senator Feinstein as well as from Senators Richard Durbin, a Democrat from Illinois, and Mazie Hirono, a Democrat from Hawaii. 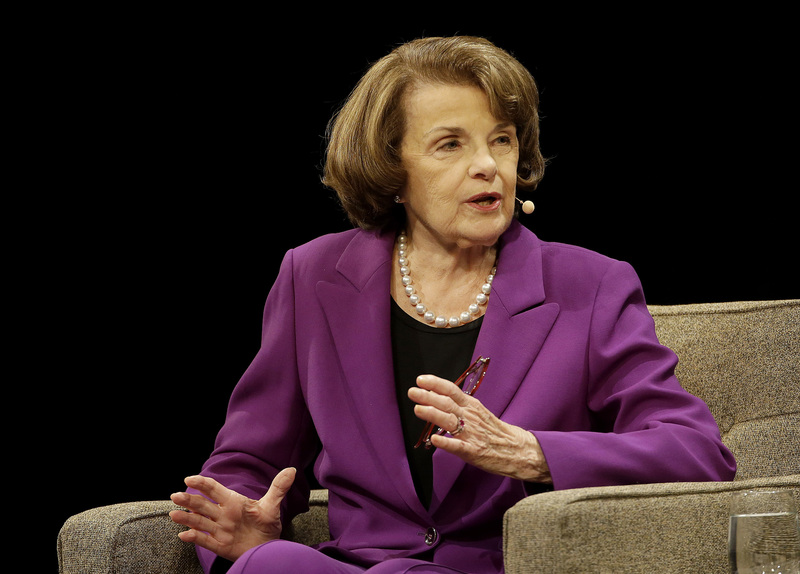 Though the article in question addressed the death penalty, Ms. Feinstein pressed Ms. Barrett on abortion, asking whether she believed Roe v. Wade was correctly decided and if it was now precedent. Ms. Barrett said should she be confirmed as an appeals court judge, she would “absolutely follow” Supreme Court precedent on abortion. Senators Durbin and Hirono also asked Ms. Barrett about her Catholic faith during the hearing. Mr. Durbin, who noted during his questioning that he is also Catholic, took issue with Ms. Barrett’s use of the phrase “orthodox Catholic” in the 1998 journal article. He said some Catholics use that phrase to cast aspersions on fellow believers, including those who hold what are considered liberal positions on social issues. “There are many people who might characterize themselves orthodox Catholics who would now question whether Pope Francis is an orthodox Catholic. I happen to think he’s a pretty good Catholic,” Mr. Durbin said. “I agree with you,” Ms. Barrett responded. “Do you consider yourself an orthodox Catholic?” the senator asked. “If you’re asking whether I’m a faithful Catholic, I am, although I would stress that my own personal church affiliation or my religious belief would not bear on the discharge of my duties as a judge,” Ms. Barrett replied. “Do you consider yourself an orthodox Catholic?” asked Senator Richard Durbin. Senator Ben Sasse, a Republican from Nebraska, suggested that the questions asked about Ms. Barrett’s faith seemed to violate the constitutional prohibition against a religious test for public office. “Some of the questioning that you’ve been subjected to today seems to miss some of these fundamental constitutional protections that we all have,” he said. But Mr. Durbin and Ms. Feinstein both stood by their questions, telling the National Review that Ms. Barrett’s public speeches and writings about the intersection of law and faith invited such inquiries. Richard Garnett, one of Ms. Barrett’s colleagues at Notre Dame, told America that he thinks the senators who took issue with the nominee’s writing “misunderstood and mischaracterized her academic work.” He said the questions about her faith appeared to harken back to a time when Catholics were seen as unable to carry out public office because of their religion. “You can’t say that our faith on the one hand has ramifications for politics, law and the common good and on the other hand expect not to answer questions about it." He said that Ms. Barrett took the same tack as previous nominees for federal judgeships in declining to answer questions about specific cases, saying that such answers “would create bad impressions for litigants” in future cases. But Cathleen Kaveny, the Libby Professor of Law and Theology at Boston College, said that individuals must “be careful about accusations of anti-Catholicism,” noting that the faith has public elements embedded within it that are fair game for questions. “You can’t say that our faith on the one hand has ramifications for politics, law and the common good and on the other hand expect not to answer questions about it and claim that faith is purely private,” she told America. Ms, Kaveny said that when an individual publicly identifies with a certain faith, it is appropriateappropriate for lawmakers to question how the tenets of that faith might influence how they would rule on the bench. “Whether a candidate for the judiciary thinks it’s prudent to answer those questions is another question,” she said. Social media lit up with reaction to Ms. Feinstein’s questioning, with the hashtag #DogmaLivesLoudly used by a number of people to express their views on the hearing. Some public figures also weighed in. Steve Bannon says Catholics "need illegal aliens to fill the churches"
Ms. Barrett’s nomination has received the support of her colleagues at Notre Dame. In an op-ed published in the South Bend Tribune, Jennifer Mason McAward, a self-described “pragmatic moderate,” noted that the entire full-time law faculty at the university signed a letter supporting Ms. Barrett’s nomination. I have to wonder if the nominee had been an Orthodox Jew, LDS, Evangelical, Muslim, or any other religious group identifying as pro-life, would Senator Feinstein have grilled them in the same way as this nominee? Somehow, I think not. It's open season on the Church, and has been for some time. I'm not a perfect Catholic, and I often question the Church's positions, but I am so tired of anti- Catholic bias in the media and political spheres. According to Mitt Romney LDS is pro-choice. Evangelical is not a religious faith, but a religious fervor, they do NOT have a fixed set of beliefs. There are many flavors of Jews, and how many are some form of Orthodox, and what is their particular belief system? There are about as many flavors of Muslim as there are of Catholic...no, Roman Catholic is not the only faith calling itself Catholic. It's open season on the Church among conservatives, pay attention to what Bannon had to say, what many fundamentalist Sects say who deny the Catholic Church is even Christian. If anything anti-Catholic bias stems from the inability of Catholics to defend the faith, and even explain the beliefs. For that matter, many Catholics make excuses for ignoring the help the poor teachings while pushing the single issue of abortion. I am a pro-life Catholic, but I believe the first step to achieving that goal is to be pro-life after the baby is born. Think that one through. Barret brought her own positions into the discussion in her writings, and she was wrong to say the purpose of their law careers was to build the Kingdom of God unless there were no students in the class who were not Catholic. Even an atheist can do good, can do what we see as building the kingdom of God, but tell him to do good instead of build the kingdom of God. Even a Catholic university that knows it has a lot of non-Catholics should be aware enough to keep the theology in the religion classes, and focus on doing good the rest of the time. shall we say, passages in the Koran? It's unfortunate, from my POV, that your article failed to point out Mr Durbin is a Catholic himself and highly regarded for his social justice positions by many of us in Illinios. His question goes to whether Catholics should be divided into "orthodox" and "other". He is an example of an admirable Catholic public servant and his questioning did not seem to me to suggest the professor could not also be one, assuming she follows the law as she clearly said she would do. Ummm, from the article: "Mr. Durbin, who noted during his questioning that he is also Catholic, ..."
Unless you are "Ukrainian Roman Rite" there is no "orthodox" Catholic. There is, however, a Catechism of the Catholic Church. I was one of the 2006 Notre Dame Law School graduates who heard that speech, a three-time student of Professor Barrett's, and among the overwhelming majority of my classmates who selected her as Distinguished Professor of the Year that year. I also happen to be a lifelong registered Democrat. I have had teachers in my life whose personal politics suffused their teaching, and whose capacity to isolate those politics from their professional judgment I doubt. Amy Barrett is not one of them. Not by a long-shot. She is a phenomenally talented teacher, loved by hundreds of students whose personal ideologies range across the full political spectrum. She's the kind of lawyer we all wanted to be -- and the kind of person, too. The three years I spent at Notre Dame were the same years in which she and her husband adopted their daughter Vivian, whose story Professor Barrett told in lieu of an opening statement. Watching her so deftly balance her family obligations with her obligations to her students and her scholarship taught me just as much about how to be a professional as her Civil Procedure, Evidence, and Statutory Interpretation classes did. I get that Senator Feinstein is concerned about growing dissatisfaction among her constituents about her liberal cred. I get that she might be facing a primary challenge. But her conduct yesterday was indefensible, posturing or not. These hearings have become a truly unfortunate exercise in grandstanding on one side and controlled breathing and self-hypnosis on the other. Fortunately, those of us who have known Professor Barrett were not surprised she was unflappable in the face of hostility. I am grateful I had the opportunity to learn from her. I am grateful we will all have the benefit of her prudence on the federal bench. The slanted nature of this article--the sole exception is the inclusion of the comment by Boston College's Prof Kaveny--reminds me of why I cancelled my AMERICA subscription. This woman's writings, her use of the divisive term "orthodox" Catholics, and her unusual views on the intersection of religion and jurisprudence clearly justify the senators' probing questions. The questions of anti-Catholic bias were likely from protestants who don't even consider Catholics to be Christian. The right wing hates Pope Francis, and his teaching what Christ actually wants us to do. They just use our faith to advance their cause. The questions were reasonable, the answers were sufficient. I would much more have doubts if it was the supreme court she was nominated for, but for an appeals court I do not see how they can reject her. If you are being questioned as a nominee for a court position, the nominee should be questioned about their writings and comments. The nominee needs to be able to apply the laws of the land & not attempt to "legislate" from the bench.